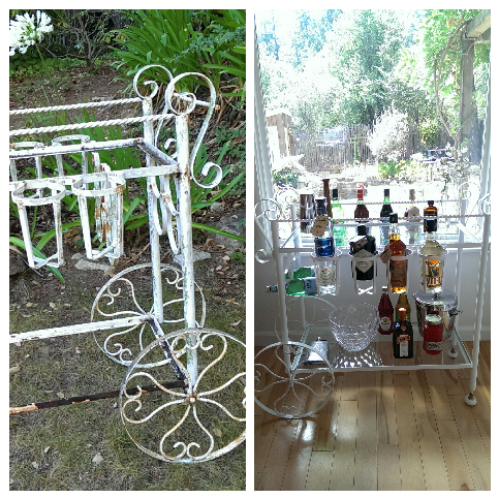 Typically, you go to the dump to get rid of things.. however, Husband found this wrought iron vintage bar cart and thought it was super cool. I probably would have just ignored it thinking it was too much to restore, but he brought it home as a fun side project. After a good power-wash and drying, it was ready to paint. 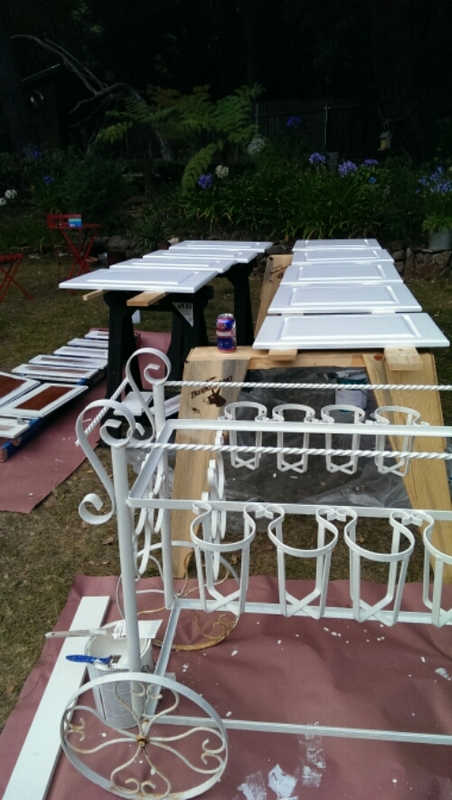 Since we were repainting cabinet doors with Zinsser, why not add another fun-filled project to our list. 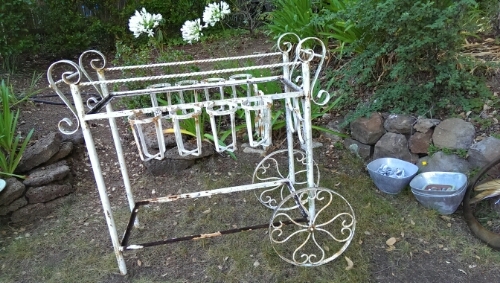 This cart proved to be pretty challenging due to the extreme rust and nooks and crannies, but it was nice to break up the monotony of perfectionist stroke lines and watching for drips. I would only work on one side at a time since I’d keep getting paint somewhere while reaching somewhere else. I do really like the heart-shaped decoration of the wheels. I tried to research a similar model online, but never found as many upright bottle holders as this one. 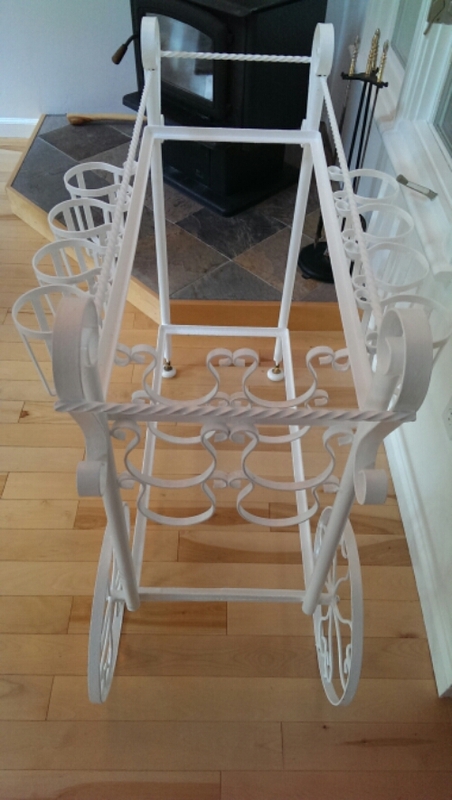 After 3 coats of sealant, we painted a few layers of semi-gloss bright white. Some rust continues to come through, so we had to spot-apply Zinsser and paint to areas. I found white ceramic doorknobs for feet because the old caster assembly rusted into the legs. I tried to pry the posts out, but the rust was so bad, it just crumbled. 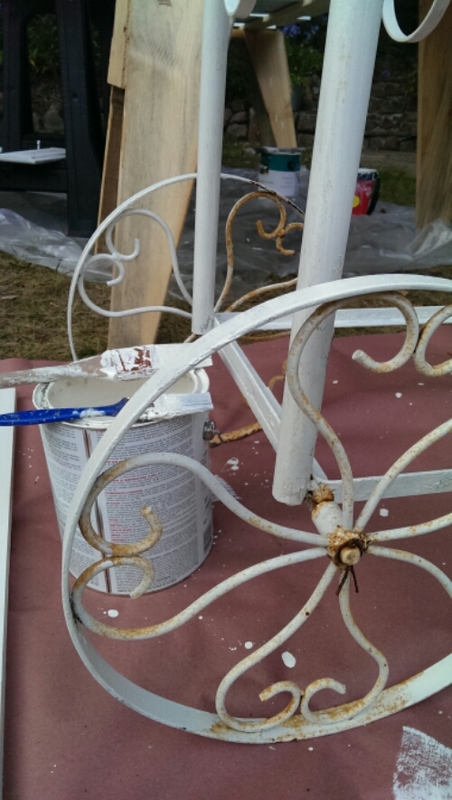 We ended up painting the posts and securing the knobs to the posts with brass set screws found at Ace Hardware. Glass tops were more easy to find. We found a window/glass place in Capotola that cuts custom sized tempered glass at really reasonable rates. I measured the interior distance of the inset at the ends and the middle and found up to .5″ variation in distance. 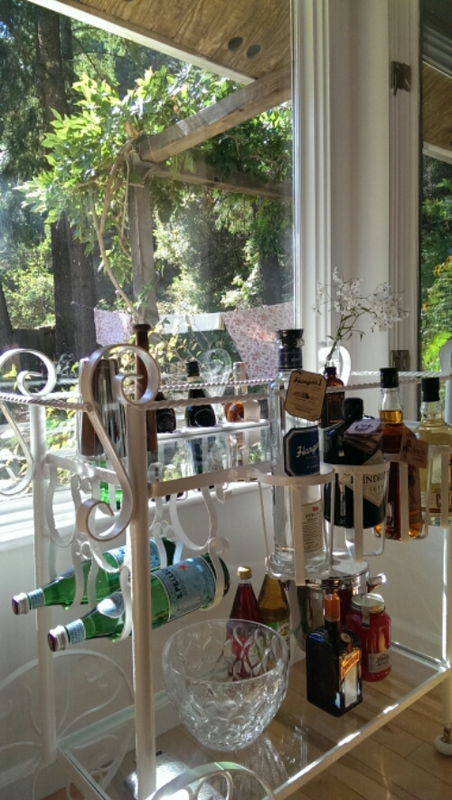 So, I erred on the safe side and gave about 1/8″ of space around the entire glass. 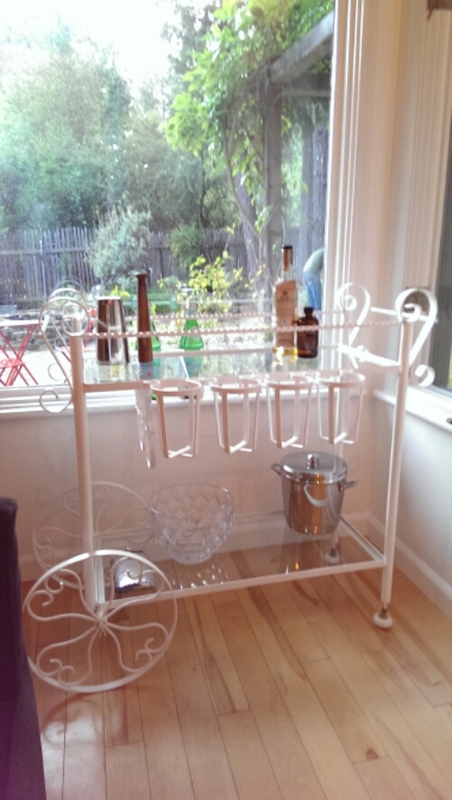 Husband went to BevMo to stock up on the usual suspects for a basic bar. 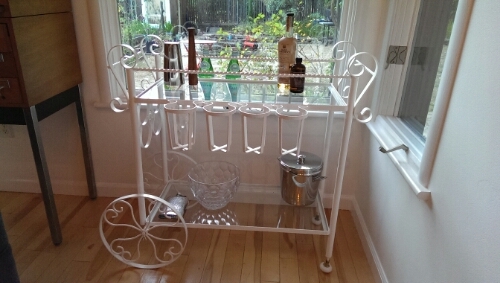 We moved the cart around a bit, but found near the window worked best! This is so beautiful, I would never want to use it if I were you!